tv-ooh: tv we like to watch on the tv: Trapped, abandoned or dead: So how might Amy Pond leave Doctor Who then? Trapped, abandoned or dead: So how might Amy Pond leave Doctor Who then? Amy Pond is to leave Doctor Who soon, in what has been described by series show-runner Steven Moffat as a 'heartbreaking' exit. And, knowing Moffat's tendency for epic story arcs and mind-boggling plots, it's likely to be on an epic scale - perhaps involving a threat to the very existence of the universe in some way, perhaps not. 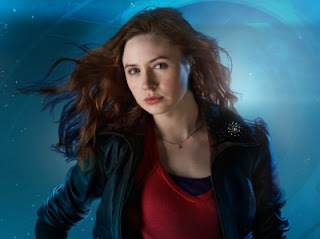 Karen Gillan's Amy has been one of the series' most popular characters, so she deserves a good send-off. But we've been here before, many times. 1. An abrupt departure: Sarah-Jane Smith left the Tom Baker version of the Doctor after he received a summons home. Her unexpected exit as he drops her off in a South Croydon cul-de-sac was a rare moment of genuine character-based emotion in the original run of the series. Of course, it wasn't South Croydon at all - it was Aberdeen, which we found out 30 years later when Sarah met the Doctor again in 2006. How's that for a story arc? See also Peter Davison's companion Tegan: The grumpy Australian air hostess left on a whim in 1984, after a gruesome battle with the Daleks about abandoned warehouses in London Docklands awaiting conversion into flats (or something). 2. The memory wipe: Catherine Tate's Donna suffered a fate arguably worse than death - after all the adventures with the Doctor, he had to wipe her mind due to her becoming part Time Lord. She reverted back to the self-absorbed, cocky Donna we met in her first episode. That was reasonably heartbreaking. See also Patrick Troughton's Jamie and Zoe, who also had their minds wiped of all but their first meeting with the Doctor prior to him going on trial for meddling. Those Time Lords again. 3. Trapped in a parallel word or decides to help the needy: Until her return, Billie Piper's Rose Tyler was trapped in a parallel world and was never to be seen again, until, er, she managed to break through, before ending up with a human-copy of the Doctor on a beach. Other companions have left to help others - be they men who look like lions (Romana), space lepers (Nyssa), or dodgy con-men who run massive freezer centres on space ships (Melanie). 4. Falls in love: Technically speaking, Amy's already in love, with her husband Rory, who is in fact a 2,000 year old revived-dead man, or a man-like replica at least. They could go off in the sunset together, but it's unlikely. Too easy. But, in the past, the Doctor's friends have left after meeting a new love interest. Jo Grant and Leela, both from the 1970s, swapped the Doctor for marriage proposals from men they'd only met five weeks previously. 5. Blown up saving the Earth: Adric, Peter Davision's social-skills-free, maths-genius companion from the early 80s died when trying to avert a space freighter that was on a collision course to Earth. He nearly succeeded but a Cyberman blasted the controls before he had a chance to fix the problem, although on reflection that's actually fine. Indelibly etched on the minds of impressionable children who watched this go out back in 1982, the impact of a death of one of the Doctor's friends is as epic as they come - even though Adric himself had few redeeming features, not to mention a horrible costume. So how will Amy go? Could she die? Death is quite heartbreaking, but also too obvious. With Moffat's tendency for complex story arcs and what he calls 'timey wimey' narrative play, it's anyone's guess - although, more accurately, it's Moffat's decision - but it will likely be 1) unmissable, and 2) maybe very confusing. Let's all just hope Rory's okay though eh?